Seasons come, and seasons go. With each passing season we face its beauty and its difficulties. Depending on what region of the world you live in you and your pet will be faced with challenge weather patterns at different times. You love and care for your pet is evident in every moment you dedicate to them and spend with them. Food, shelter, playtime, and medicine all play a part in their health and well being and safety. You may wonder what can be done when the weather, unpredictable as it can be sometimes strikes your area in different ways. 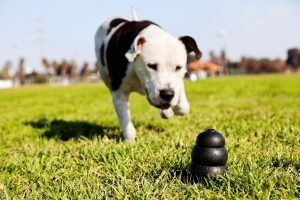 First and foremost, safety should always be a top priority, your pet relies on you for so very much. They look to you for protection, ensuring that everything is still well in their world. They have an ability, what some may consider to be a sixth sense to know when difficult weather is coming. Think of your most beloved friend when he paces the house at 3am, back and forth, unable to settle. He or she may nuzzle your hand as you try in vain to sleep, possibly they just sit beside your bed or even hide underneath it. You are most times unaware of what is coming until you start to hear the pitter patter of rain on your roof or a distant crackle and boom of oncoming thunder. Below I have compiled a list of some weather patterns that may crop up in different regions of the world that hold their own difficulties for you and your pet. I will break them down further, what you can do for you best friend, to protect and offer comfort during these difficult times that only mother nature has control over. Warm weather can be a joy, time to soak up the sun, play in the surf and sand and watch your garden grow. Extreme heat can be torture for anyone, including your pet. 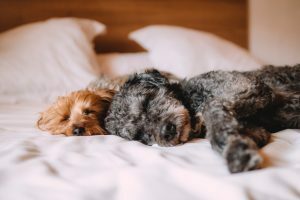 If you have air conditioning allowing your pet access to the house frequently to cool off as you yourself would is a great way to bring relief, especially since they are wearing that fur coat. If you don’t have Air Condition a fan that they can lie beside and relax will be of great help. Plenty of water to drink and run through if possible is another lifesaver on a hot day. Dogsicles made of peanut butter, yogurt or broth is a real treat that your pet friend will love www.kissablecanine.com/dogsicles-recipe/ offers a recipe that you can customize to your dog’s taste. Cold weather can be deadly for anyone, animal or man. 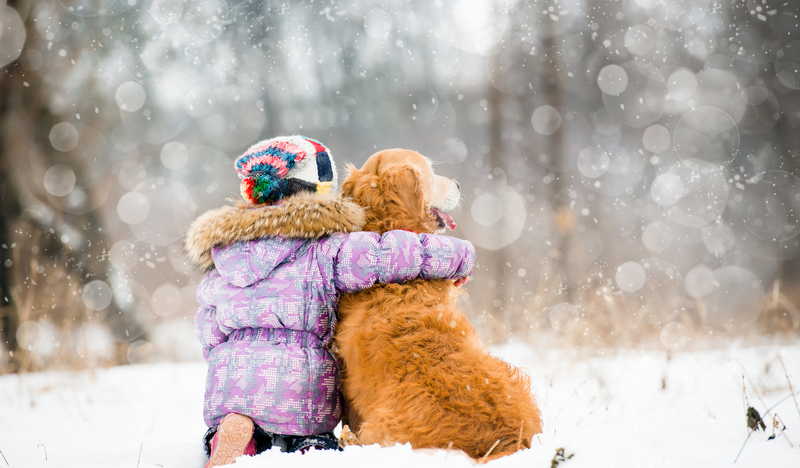 Your fine friend may wear a coat but that doesn’t mean they can’t get cold or freeze. If you find yourself in extreme cold weather, blizzard or icy weather, a blanket or dog coat is a nice addition to your dog’swardrobe ensuring their warmth and comfort, www.chewy.com has a large selection of dog attire. Shelter is the best possible precaution in these harsh weather conditions. If you find yourself out in this type of weather unable to find shelter, your dog has the better advantage than you, but blizzards and icy weather can be hard to move around in, even for a dog but thankfully their sense of direction, thanks to a very sensitive nose will have you back at the dinner table in no time at all. 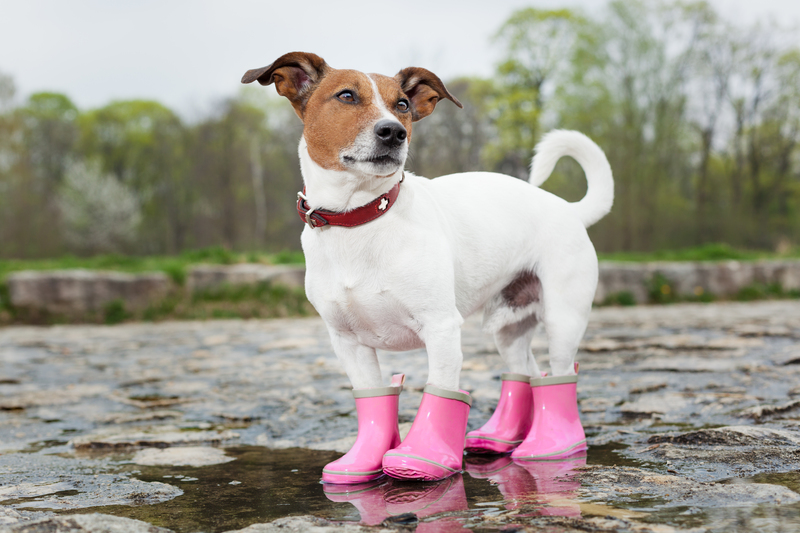 Your dog will most assuredly inform you of an upcoming storm by his actions. 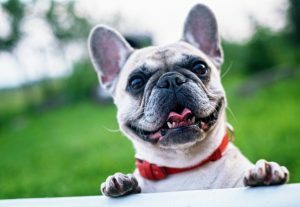 If he or she is primarily an outdoor pet, offering the shelter of your home, garage or barn will offer them mental and emotional comfort, and an ability to settle down easier. A comfortable bed or spot to lay down away from windows and doors, all the better, and www.orvis.com offers a high-quality wraparound pet bed for security and comfort. If you can sit beside them kudos because your company offers the reassurance that all will be well again, no one likes to be alone when they are scared. 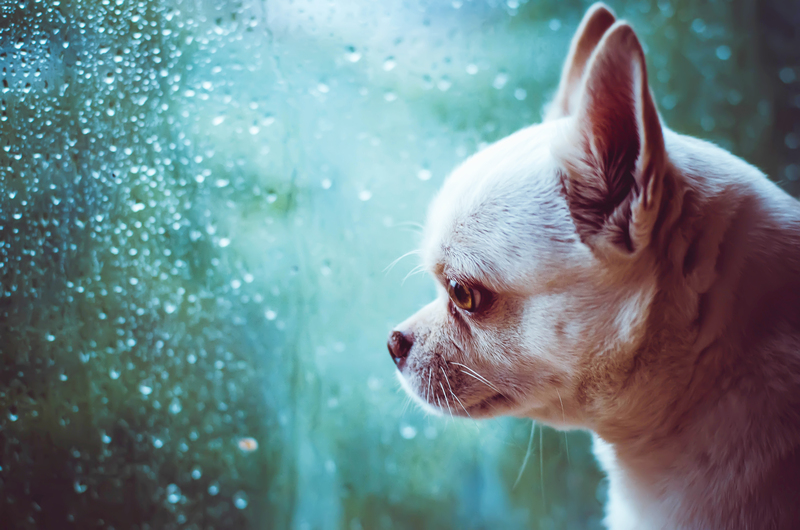 These unpredictable and sudden storms can be devastating, and no one should be outside during them, man or animal. Providing safe areas for your pet where they can’t hide well but you can keep an eye on them are essential. Making sure anything dangerous is removed from the area since animals have a good sense of these storms and can become very frightened. Keeping extra supplies of their food, meds and such is always a good idea because you never know what will happen during these storms. Never allow your pet to run free because they can become confused and easily lost or hurt. A cat carrier, dog crate or at least keeping your dog on their leash like the one offered at www.thundershirt.com is a good way to know where they are, and always ensure their safety. You may not think very much about wind until your live in an area where it is unpredictable and extreme. 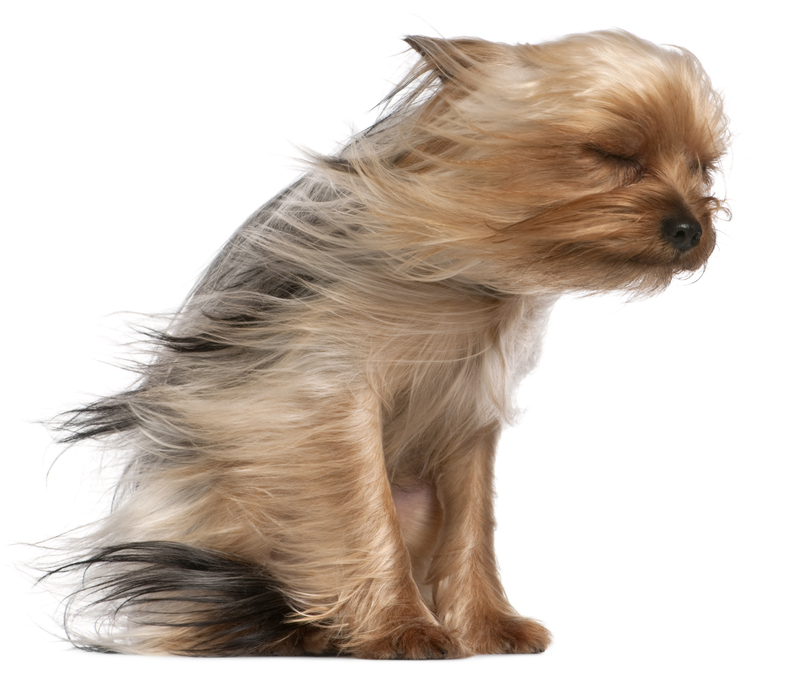 Strong winds can be devastating causing accidents and injuries to both human and animal. The best precaution you can take during this type of weather is to take your pet inside and keep them inside ensuring their safety. Preferably away from windows that may break and doors that may be blown open. If for some reason you must take your dog out with you during a dust storm, a pair of safety glasses will ensure your dogs vision is left in tact from sometimes damaging dust and debris, find them at www.rexspecs.com. During any type of extreme weather, the best place for your pet is right beside you. You can ensure their safety and that their needs for food, drink, and love are met. Knowing where they are will give you peace of mind as well which will allow you to tend to other important matters. A pet emergency kit is a good item to put together and keep beside your own emergency kit. Inexpensive, easy to assemble but well worth the effort during any difficult weather that may appear, or any situation for that matter. When you have the essentials that your you and your pet need you will feel calmer during difficult situations and this calm will be transmitted to your pet so you both can deal with whatever lies ahead. Looking for a product that provides pet safety, freedom and is budget friendly? Look no further than an invisible fencing provided by a leader in the industry, Freedom Dog Fence, Lexington, NC USA.